Across many facets of life, people look for their particular type. From the type of person they’ll marry to the perfect type of yellow-to-green ratio of a banana, everyone has a preference and their perfect match. Just like people, brands naturally pair with particular types of colors, tones, and typefaces. Imagine Queen Elizabeth for a minute. While she is the face of the British monarchy, historically seen as unrelatable, individuals across the globe still feel connected to her. Now, you could say, “It’s just her public presence,” but I would argue it’s due to her bold outfits and lovable corgis that make her feel more approachable. Undeniably, she has created a brand for herself over the decades. So let’s break it down: How can the Queen of England have a brand that is royal and relatable? If her brand had a specific font, what would it be? And, more importantly, how do fonts translate to your own brand? Based on title alone, a safe type choice for Her Royal Majesty would be a classic serif. 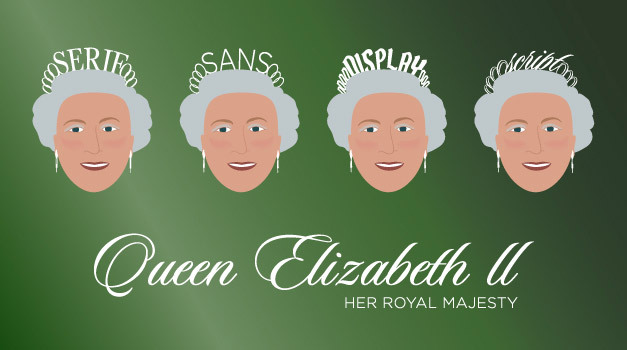 Just like the queen, serif fonts mean business and offer a classic, sophisticated vibe. Easily recognizable brands such as The New York Times and Wells Fargo®, both with origins in the 1850s, have worked hard to create a trustworthy brand in which serifs instantly convey loyalty — qualities that each company should celebrate for centuries to come. Even though royalty often symbolizes the past, Queen Elizabeth has evolved as a contemporary with the changes of each decade throughout her reign while remaining politically neutral at the same time. For these reasons, a modern, simple sans serif might be in order. Tech giants like Google® and Facebook® use fonts in the sans serif family. This is largely due to increased readability on mobile devices, but also because sans serif fonts quickly convey the message and don’t distract the reader with flourishes. Sans serif fonts let the writing speak for itself and easily become part of the overall design rather than creating their own voices. All things considered though, sans serif doesn’t seem to embody the quirky queen fully. What about a bold display font to match her bold wardrobe? Display fonts easily showcase personality. They usually pair well with minimal photography and color options. Display fonts are great for large, impactful headlines. They speak for themselves, as seen in brands such as Jack Daniel’s® and Disney®. While great for many brands, display fonts are almost too personalized for such a regal figure. Let’s consider a script font: though they are technically and categorically display typefaces, scripts are often placed in their own type group. In my opinion, script fonts are the most elegant of them all. As seen in brands such as Coca-Cola® and Cadillac™, script fonts have helped to create an air of sophistication around these companies for more than 100 years. The Coca-Cola company might be the most “everyday” brand in the world, and a script font as delicate as theirs might suggest discrimination from one social class to another. But the company has worked hard to associate the dainty details of their logo with their timeless brand to make known that their quality products are for everyone; just like the queen, regal and relatable. Typefaces have personalities and characteristics just like people and brands. Based on these classifications, a sophisticated script as Her Royal Majesty’s main typeface, along with a sans serif font to play a supporting role, seems appropriate to convey her overall brand: refined, detailed, approachable, and modern. What adjectives describe your brand and complement its characteristics? Before you start searching for a swipe app, know that typeface Tindr® doesn’t exist yet. But never fear, we’re happy to help you navigate the important task of font selection and finding your brand’s perfect type.